The territory in the surrounding area was colloquially referred to as, Rattlesnake Flats, due to the large number of the snakes found in the area. The region was dubbed Golden Valley in 1902 after a group of land surveyors noticed that the sunlight gave the surrounding grasses a distinct golden color. 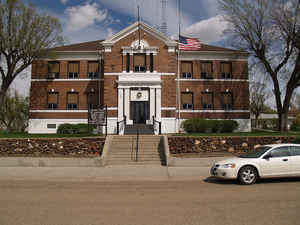 Created from the western portion of Billings County by a favorable vote at the November 10 general election, although litigation delayed its official designation as a county until November 11, 1912. The name was probably chosen for the favorable image it projected although a Golden Valley Land and Cattle Co is known to have been a major land owner here in the early 1900's. Government organized: November 13, 1912. County Seat: Beach, 1912-present. As reported by the Census Bureau, the county has a total area of 1,002 square miles (2,600 km2), of which 1,001 square miles (2,590 km2) is land and 1.6 square miles (4.1 km2) (0.2%) is water.